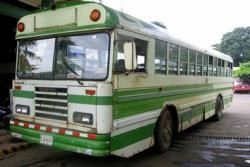 Buses are a economical and efficient way to move around Costa Rica. Buses reach to every corner of this small country and almost every town has bus service at least once a day, while larger towns have buses departing to destinations throughout the country every hour. Buses of every style from old school buses to luxurious Mercedes buses with bathrooms, A/C, and reclining seats service costa rica with the later usually accomodating longer routes. We have created a list of the most popular destinations below with departure times and travel time. Schedules can change without much notice so please confirm using the numbers listed or you can check Costa Rica's Bus Schedule here. Up to the minute bus fairs can be found at the official site ARESEP. Helpful hint - If you have lots of bags and need extra room to stretch your legs, you may want to see if you can reserve 2 seats for your trip. If you are looking for other forms of transportation including taxis, transfers, or rental cars please take a look at our Transportation page.